A Night at the Opera: R. Strauss "Rosenkavalier"
-> check in the web page some min before 11:00 CET as this is an AMAG "special price" production tickets will VERY sell fast. 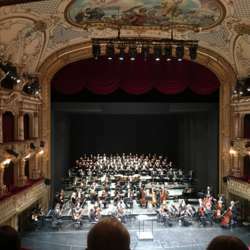 Zurich opera's revival features a top-class ensemble of singers under the guiding hand of General Music Director Fabio Luisi. Krassimira Stoyanova, who was last heard at Zurich Opera House – to a stormy reception – in Christian Spuck’s production of Verdi’s Messa da Requiem, will be singing the Feldmarschallin. The native Bulgarian is considered one of the greatest Strauss performers of our time, and has been celebrated as the Marschallin at such venues as the Scala in Milan and the Salzburg Festival. After her acclaimed Zurich appearance in the concertante performance of Donizetti’s La fille du régiment last season, the charismatic French soprano Sabine Devieilhe will now give her role début as Sophie at Zurich Opera. Anna Stéphany, who celebrated a great success as Charlotte in Massenet’s Werther, will be singing the role of Octavian. Christof Fischesser can be heard as Baron Ochs. German with and English surtitles.